Founded in 1989, by Rocky Hill, JCH Construction, Inc. has provided turnkey trenching services to the San Antonio and surrounding areas. By providing trenching rock sawing, and backhoe services there has been no job that is too small or too large for San Antonio Texas or the United States. We provide state-of-the-art construction materials and workmanship to our customers. By providing a competently trained and safe workforce, we maintain a level of integrity that is standards above the underground contractors’ industry. We do work for a number of trades including electrical, plumbing, concrete, and utility contractors. Our customer base is comprised of municipalities, land developers, home builders, commercial, and public works. 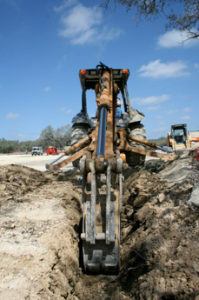 We offer turnkey trenching. We will trench, backfill, compact, and haul off. Our goal is for our customers to focus on what they do best and let us take care of the rest. We can price by the job, by the foot, or by the day. Please fill out the form below and we will contact you via phone or email.